So for Sofie’s birthday, I decided we all needed monkey-themed shirts. I made The Hubs wear a shirt I painted a yellow hat on (you know, The Man with the Yellow Hat?!). He wasn’t too thrilled about the idea, but was an excellent sport about it! Especially when I announced I wasn’t wearing mine. My bananas looked AWFUL and I flat out refused to wear the shirt. I was really upset and as I went to chuck the shirt in the trash, I remembered I no longer throw away clothes that could become something else! I tossed the shirt in my upcycling pile and have been eyeing it for the past 2 weeks. 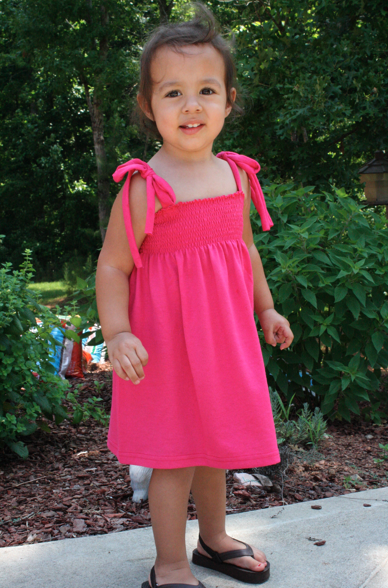 Last night I decided Sofie needed a new sundress/bathing suit cover-up. So bad bananas became cute dress! I cut it off straight under the armpits. 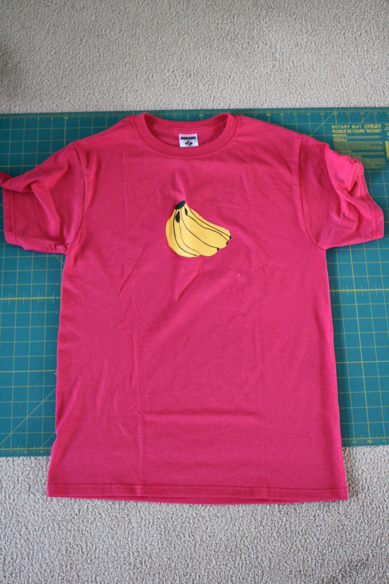 Then I cut off each sleeve, the neck, and the bananas. I wanted to cut my straps at 2″ because once sewn and turned, they’d be nice and chunky. 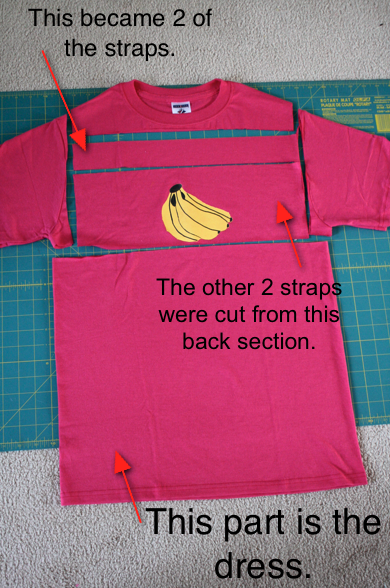 I was able to get 2″ between the bananas and neck, then used the back piece of the bananas to cut 2 more 2″ strips. The construction was EASY. I shirred the dress part, leaving the existing hem as the bottom of the dress and the top of the dress raw (knit doesn’t fray!). I did 11 rows at 1/4″ intervals. I folded the straps in half lengthwise and sewed at 1/4″ inseam. 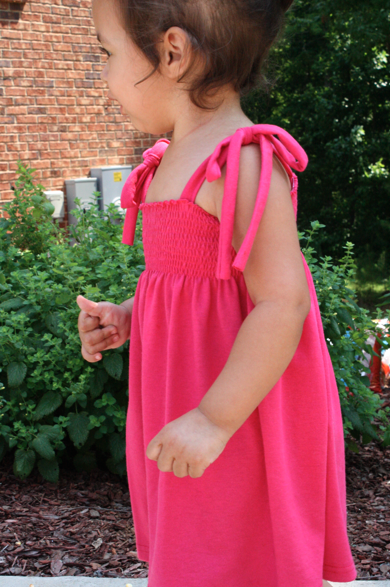 Then I turned them, left the ends raw, and sewed them to the front and back. Tackled the toddler, tied straps, and done! Oooh man, I love your blog. You are amazing, Melissa! What a precious dress!! (Adorable model too!!) Way to upcycle!! Thank you ladies! 🙂 And thanks for letting us use your garden for pictures, Mom! That is way too cute!! So cute! You really have great talent! Hi Melissa! 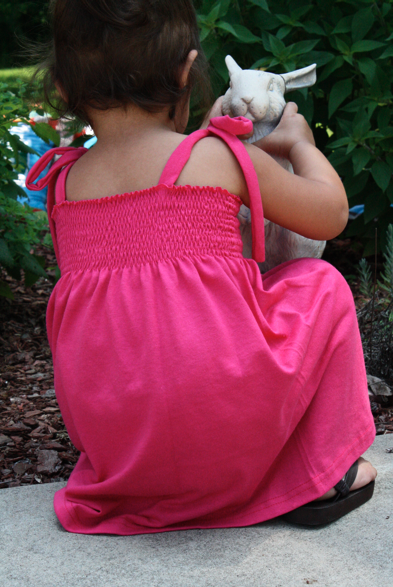 Feel free to stop by the blog anytime…that’s what it is there for. You certainly have a gift for sewing (this coming from someone who seriously cannot sew a button on properly) and you have a sweet family. Hope all is well. Stay in touch. Girl – I want you to teach me how to do the shirring thing one day!! But I am guessing that one day will be no sooner than 5 years from now as you and I both seem to keep ourselves booked and busy as ever! But I would like to put this on my list of things to learn (as well as how to better use the sewing machine!). AWESOME GIRL!! You are amazingly talented! All of your ideas are great. Thank you for sharing. I was just going to add that since you used most of the shirt, you could use the sleeves for headbands and at fake flower with a hot glue gun. That is what my girls like to do the sleeves. Can you point me to a good tutorial for shirring?